One of the most exciting of the Family Adventure Charters is our shark fishing tour. With no more than six people aboard, we leave about three hours before dark. It's about a 45 minute ride in the Gulf to the "Shark Hole". The ride down the Crystal River and out in the gulf can be breathtaking and full of wildlife. After arriving at the shark hole, we anchor up and start chumming to attack sharks and any other hungry fish in the area. When the fun begins, it is generally nonstop. Common catches could include everything from a 10 pound black tip to a 250 pound bull shark. We use quality Penn 6/0 reels, stout rods and 60 pound braided line with steel leader. We have a fighting chair for the occasional "big one". 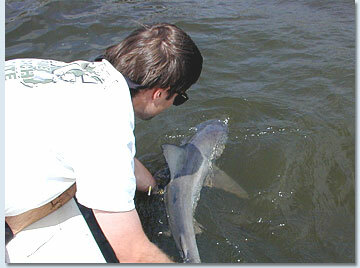 Shark fishing in the Crystal River area is generally better in the warmer months. The most common sharks we catch are bull sharks, black tips, spinner, sandbar, black nose, lemon, sharp nose, hammerhead, bonnet head and tiger sharks. All of these sharks will test a seasoned angler's skills. We attempt to release all our sharks unharmed. We are allowed to keep two sharks per trip if a customer so desires. The best eating sharks are black tips and can be prepared many ways. Safety is a concern when shark fishing, especially at night. Only the captain and the mates are allowed to handle the fish and bring them into the boat. All the tackle and everything you need to catch sharks is provided. You do not need a fishing license to fish on one of our charters. We keep plenty of bottled water and ice on our boats. You will need a cooler back at the dock if you wish to take fish home with you. We will be happy to clean and pack your catch. If you want anything to eat while on our shark fishing charter, you are welcome to bring it with you. Our shark fishing trips are normally 6 hours long. A charter can be extended if so arranged be fore leaving the dock. Our shark fishing charters are family friendly and a trip you will remember forever. 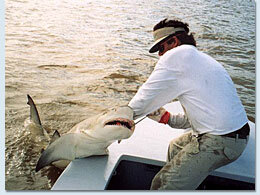 To book a Crystal River shark fishing charter, call us direct at 352 445-5489.